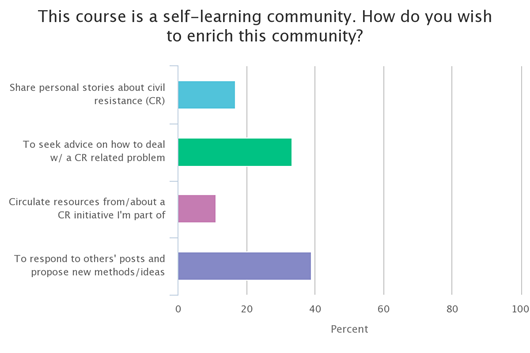 In response to increased demand for knowledge about civil resistance, ICNC hosted in 2016 an additional online seminar beyond its annual ICNC/Rutgers online course. This second course offered was entitled “Civil Resistance Unpacked: Strategic Practice and Analysis” and took place from December 6, 2016 to January 25, 2017. In the past several years, ICNC has received rapidly increasing demand for knowledge and greater understanding of the dynamics and power of civil resistance. Individuals, groups, and organizations in the United States and around the world are reaching out to us in record numbers to inquire about civil resistance learning opportunities. We view online courses as a way to better keep up with this increasing demand, achieve greater scale, and reach more people in our educational efforts. Based on the online seminar ICNC offers each year in partnership with Rutgers University, the special online course “Civil Resistance Unpacked: Strategic Practice and Analysis” offered modules on civil resistance with a variety of readings and videos that guided participants in their learning, online discussions, and interactions. Participants included activists, organizers, scholars, students, members of the policy community and NGOs, journalists, and others with extremely diverse experience with civil resistance and knowledge on this field of study and practice. wanted to seek advice from and exchange ideas with other participants. In addition, the participants specified their learning interests and goals; their recent experience related to civil resistance; how they planned to enrich a self-learning community that this special course was based on; and where they would apply the knowledge gained from the course. Civil resistance is a social and political phenomenon that defies a long-held belief in the power of arms to challenge a brutal, violent adversary. Contrary to the violence-centered narrative that dominates mass media, nonviolent resistance campaigns against repressive states have been on the rise in the last few decades, surpassing violent insurgencies by almost 5 to 1 in the last 15 years. Informed by these important developments in research and the practice of civil resistance, this free, online course provided an interactive, in-depth, and multidisciplinary perspective on civilian-based movements and campaigns that defend and obtain fundamental rights and justice around the world. The course aimed to explain the nature of civil resistance and its force, underlying dynamics, and effectiveness. During the course participants reflected on the skills and agency of ordinary people, their strategies and tactics, how movements can confront repression, the backfire effect, and how movements have caused defections among their adversaries’ supporters. We looked at how entrenched political and social structures and practices shifted under the pressure of organized nonviolent movements, and the long-term impacts on societies, nations, and institutions. We also studied the role of gender and women in civil resistance. Finally, the course also examined a variety of case studies of civil resistance struggles, including movements for democracy and human rights, as well as movements challenging corruption, corporations, and abusive and violent non-state actors. The online course involved a number of activities, including forum posts and online discussions, readings, and viewing videos. The main difference between this course and previous online seminars was in the way that online interactions were envisaged to take place. “Civil Resistance Unpacked” was an entirely participant-driven course whereby, after reviewing relevant modules, participants interacted with one another on various forums without additional ICNC moderation or substantive input. In that sense, participants were part of a learning community that was built around participants’ motivation, open attitude to learning, desire to share and interact with others, and relevant knowledge and experience. Participants formed a learning community whose intellectual strength and vibrancy depended solely upon its members and their active and insightful written contributions in various forums. No outside moderators joined this class. A specific set of questions set up in advance by course administrators in the discussion forums guided participants’ exchanges. In these forums, participants were expected to monitor and read other learners’ posts, share innovative ideas and thoughts within the learning community, ask follow-up questions to other participants, suggest answers and plausible solutions as well as, in rare cases, flag any inappropriate behavior on the forums. Because no outside moderation of online discussions was envisaged for this course, a specific code of conduct was developed to ensure that participant interactions and knowledge sharing were as meaningful, substantive, and respectful as possible. Participants committed themselves to following and enforcing the follow code of conduct. Focus on the phenomenon of civil resistance. If you find your conversations going onto other topics that are not directly related to the course, then you should feel free to take those conversations outside of the course (i.e. over email, Facebook, phone, etc.). Focus on debating ideas, and separate people from ideas. If you disagree with an idea, don’t attack the person who posted the idea, or make assumptions about their motives. In addition to the readings, refer to other source materials to support your statements or as background information to the point you are making. Read carefully and in entirety posts made by other people before replying to them. If something is not clear in someone’s else comment, do not hesitate to ask for clarifications and further explanations while you offer your own points of view on the discussed matter. Post regularly to the required forums and catch up as soon as possible if you fall behind. Formulate your thoughts and ideas in clear language. Other participants may have limited knowledge about the case that you are elaborating on. Other learners are people too, although you will not necessarily see them. Do not use ideological or divisive language and instead apply objective reasoning that is backed up by evidence and arguments from authoritative sources. Humor, encouragement, praise, constructive criticism, and putting yourself in someone else’s shoes are the most effective ways to engage with others and facilitate informed discussions that do not exclude anyone. The learning experience is optimized when all participants remain active all the way through the end of the course. Do not abandon your fellow participants in the course (unless there is a family or personal emergency); they are counting on your active contributions, just as you are theirs. Do not be tardy with posting during the week as this negatively affects your and other participants’ learning progress. Do not use ad-hominem attacks or any race, gender, religion, national origin, age, disability, sexual orientation based attacks. Participants were expected to spend between 7 and 10 hours per week in the online classroom, or a minimum of 1 hour per day for the full duration of the course on reviewing materials, posting comments about the readings and assigned videos, and interacting with/responding to other participants’ posts. 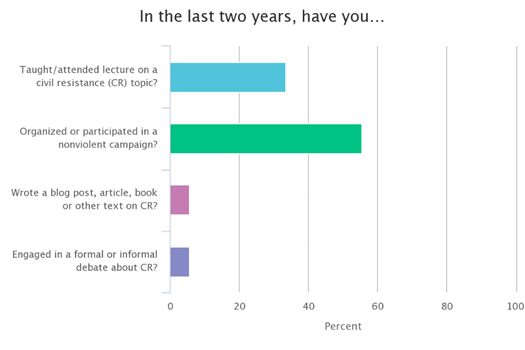 ICNC distributed pre-seminar and post-seminar surveys to measure gains in learning progress among course participants. Included below are the graphed responses to the questions included in the surveys. 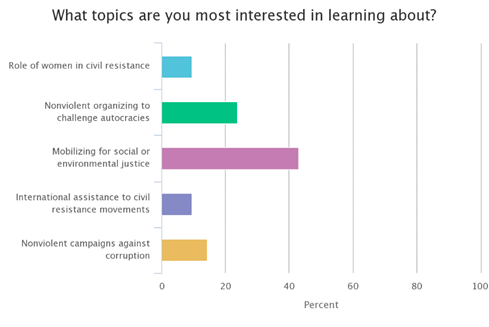 In general, participants’ responses illustrate a positive trend in learning gains in civil resistance knowledge. 10. Do you think that nonviolent civil resistance is more effective than violent resistance against repressive regimes?